Sea Patrol is a fictional Australian TV series which deals with the life of a navy ship and its crew across a number of special events. The first season was launched in June 2007 and produced by Nine Network, one of the most important broadcasting channels in Australia. There have been two seasons so far, the second one being broadcast from March 2008 until June 2008. The executive producers, Hal and Di McElroy intend to air at least 6 seasons and the third one is already being broadcast. The producers attracted audiences with popular actors such as Lisa McCune who played in several films and a dozen TV series and who is one of the most popular actresses in Australia. Most of Sea Patrol was shot on location in Queensland, a north-eastern state in Australia. Each episode deals with something illegal such as drug smuggle, illegal immigrants and so on. Yet, all episodes are connected together with one main plot. Two real ships of the Royal Australian Navy were used to shoot the episodes. The first season ship is a Fremantle class patrol boat and the ship for the second season is an Armidale class patrol boat. Becauseof this highly sophisticated equipment, the cost of the series rose to 15 Million Australian Dollars, which made it the most expensive television series of all times in Australia. Due to this huge budget, Sea patrol was one of the most anticipated Australian series ever. However, the reception of the series was not as good as expected, receiving at first mixed but generally positive reviews, but then decreasing after a while. For example, Michelle Hover, a reviewer for militarypeople.com.au, heavily criticized the series saying that “the script was technically inept and did not support the caliber of actor of Lisa McCune”. Indeed one of the flaws of the series is that it is often surrealistic: in one of the first episodes, the crew finds a woman lying unconscious on a beach and the crew takes her on board; when she arrives on board she suddenly stops breathing and the best idea that comes to the mind of the captain is to do a tracheotomy with the barrel of a 9-mm gun, instead of a pen. 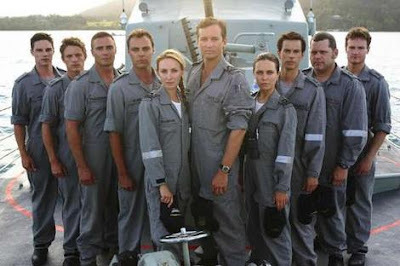 Despite this criticism, however, Sea Patrol received some awards such as “Best Achievement in Sound for a Television Drama” and some of its actors –including Lisa McCune- were nominated for the “most popular actor” award. Moreover, the series was so successful that it has been broadcast in thirteen countries so far. The last season on air started March 2009. Why don't you go and have a look!